The federal minimum wage is just $7.25 and has not increased since 2009. The Raise the Wage Act of 2019 would gradually raise the federal minimum wage to $15 an hour by 2024. EPI research shows that raising the federal minimum wage to $15 an hour by 2024 would lift pay for nearly 40 million workers across the country—26.6 percent of the U.S. workforce. The increases would provide an additional $118 billion in wages for the country’s lowest-paid workers, with the average affected worker who works year-round receiving an extra $3,000 a year. The map below shows the share and count of workers in each congressional district that would receive wage increases if the Raise the Wage Act of 2019 were enacted into law. The map also breaks down the share of workers who will benefit by age, gender, and race. Click on any congressional district to see more information about the workforce that would be affected by the proposed federal minimum wage increase. The table below the map lists all the data for all congressional districts. Note that the map shows where affected workers live, which may be different from where they work. EPI’s Minimum Wage Simulation Model takes these differences into account, by using data from the American Community Survey to compare the proposed change in the federal minimum wage with the prevailing minimum wage where individuals work. 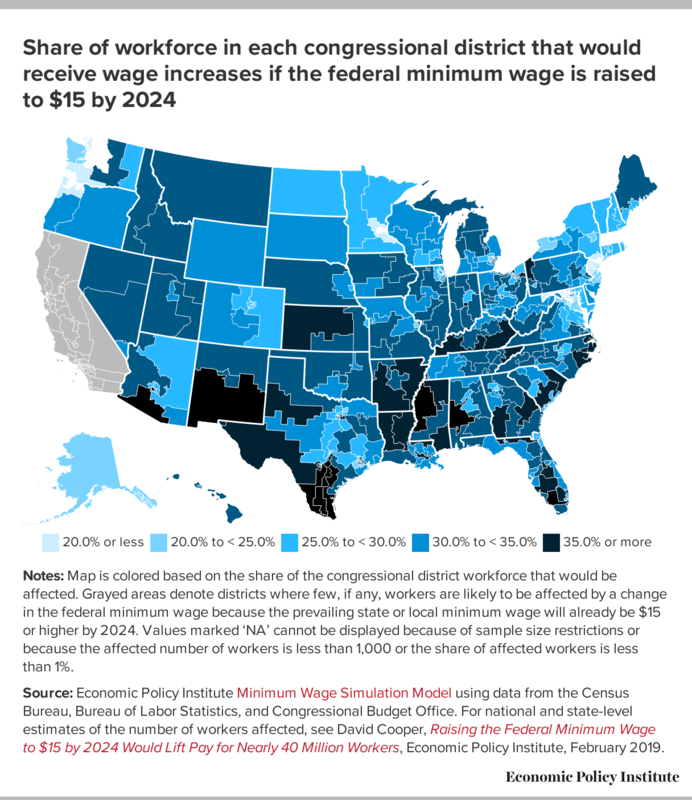 As a consequence, there may be small numbers of affected workers in congressional districts where the local minimum wage will already exceed $15 in 2024 because some workers living in that congressional district work in a different district. See the methodology for greater detail. In addition, the Raise the Wage Act of 2019 also gradually raises and eliminates the lower minimum wage for tipped workers. In some jurisdictions that will already have a $15 minimum wage in 2024, there may still be tipped workers who would be affected by the change in federal policy because their state or local tipped minimum wage law would still be lower than the proposed federal tipped minimum wage. See EPI’s research on the tipped minimum wage for more information. Note: Values marked ‘NA’ cannot be displayed because of sample size restrictions.